Written by a group of academics and practitioners, this guide is for construction practitioners having to manage real projects. It shows how the risk management process improves decision making in conditions of uncertainty. This new edition includes the input of the Turnbull report, as well as to introduce the concept of corporate, strategic business, and project level risk. A thorough understanding of these concepts will provide the project manager with the basis for effective decision making. 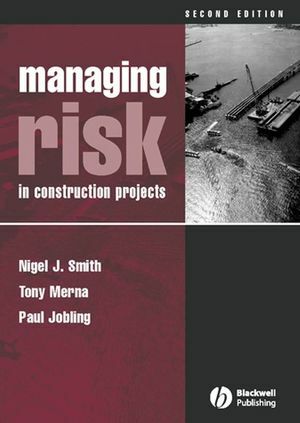 "This book should be compulsory reading for all concerned with the management of risk in construction – whether academics or practitioners." "A valuable addition to the literature ... which helps condense, simplify and provide practical advice on how to implement risk management on construction projects." Nigel Smith is Professor of Transport Infrastructure & Project Management at the School of Civil Engineering, University of Leeds. Tony Merna is a lecturer in Civil & Construction Engineering, School of Mechanical, Aerospace and Civil Engineering., University of Manchester. Paul Jobling is a Senior Professional Associate and Project Director Risk Management at Parsons Brinckerhoff. 2.5 Effects of Project Phase on Risk. 3. UNDERSTANDING THE HUMAN ASPECTS. 3.1 Risk Management – People. 3.2 Risk Management – Organisations. 3.3 The Risk Management Process. 3.4 Some Guidelines to the Risk Management Process. 3.5 Preparing a Group for a Risk Session – Risk Identification. 4. RISK AND VALUE MANAGEMENT. 4.2 The Standard Risk Management Model. 4.3 Apply Risk and Value Management. 4.5 Understanding the Project Risk. 4.6 Applying Value and Risk Management. 4.7 Iteration of the Process. 5. QUALITATIVE METHODS AND SOFT SYSTEMS METHODOLOGY. 5.2 Review of Project Programmes and Budgets. 5.4 Using a Risk Log to Formulate Risk Management Strategy. 6. QUANTITATIVE METHODS FOR RISK MANAGEMENT. 6.2 Project Appraisal and Selection.